This is a new one on my radar. I purchased it while on the hunt for a product that would be suitable for the max hydration method I’m testing out right now. The John Masters Organics Citrus and Neroli Detangler is a lightweight formulation, which claims to detangle while conditioning simultaneously with the composition of 18 certified-organic ingredients. Some of these ingredients include aloe vera leaf juice, soy protein, borage oil, wheat amino acids, jojoba oil, coconut oil, sunflower oil, lemongrass oil, camellia sinensis extract, chamomile flower extract and calendula flower extract. All the ingredients mentioned above have been featured at one time or the other on this website. These ingredients strengthen hair, soften hair, eliminates tangles, and treats scalp issues. Additional ingredients like grapefruit, lemon and neroli essential oils also provide a pleasant aroma and relaxing effect. Full ingredient listing below this article. John Masters Organics Citrus and Neroli Detangler is light and has a smooth milky consistency, which comes out the bottle with ease. The manufacturer indicates that the detangler is for fine hair/hair without shine but I used it diluted as step 2 in the max hydration method regimen and liked the results. Step 2 of the max hydration method involves co-washing and detangling then sitting under a hair steamer for 15 mins. I quite liked the results. Afterward, my hair was super soft and buttery. I believe it also improved the end results after the washing out the healing clay. John Masters Organics Citrus and Neroli Detangler can also be used as a leave-in conditioner and a daily conditioner. Update: Since I wrote this review, I discovered the new John Masters Organics Citrus and Neroli Detangler formula now contains several cones. I would not use this as part of the max hydration method but may work as a cowash. Restores strength with soy proteins and promotes shine with coconut oil and wheat protein. Essential oils contained in the formula provide an uplifting aroma. Detangles without weighing the hair down. Certified-organic and comes in in eco-friendly plastic containers. Great for colour treated hair as well. You need only a small amount so expect the bottle to last for a while. While it did it’s job and detangled my hair under running water, I’m not too sure about its efficacy as a leave in conditioner and would probably mix it in with something else to enhance its properties. Fine haired types might find it too heavy to use as a leave in. The detangler now contains cones. If you’re trying to avoid all forms of cones, then this isn’t your best bet. Where to Buy John Masters Organics Citrus and Neroli Detangler? 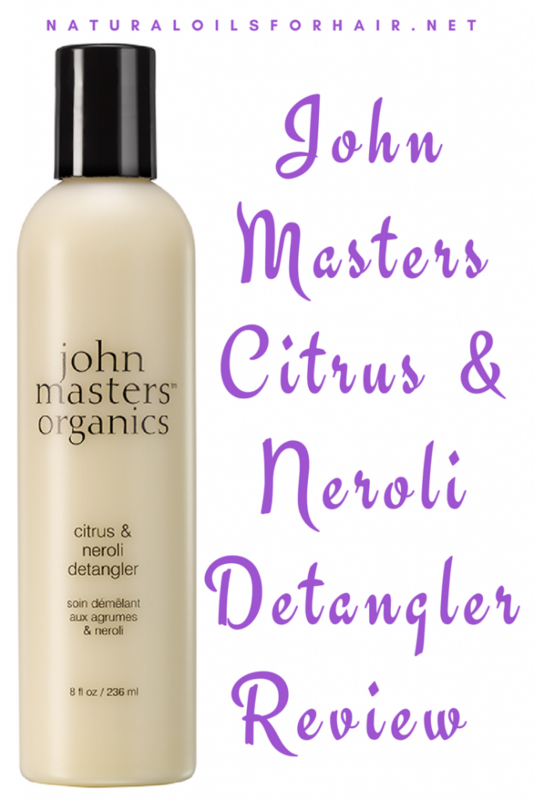 John Masters Organics Citrus & Neroli Detangler comes in 3 sizes – 2 oz trial size, 8 oz standard size and 16 oz. The standard size is $$. Overall, I rate the John Masters Organics Citrus & Neroli Detangler 8/10 and should be suitable for all hair types. John Masters Organics Citrus and Neroli Detangler Ingredients: Aloe barbadensis (aloe vera) leaf juice*, aqua (water), behentrimonium methosulfate, cetearyl alcohol, panthenol (vitamin B5), sorbitol, simmondsia chinensis (jojoba) seed oil, cocos nucifera (coconut) oil, hydrolyzed soy protein, wheat amino acids, helianthus annuus (sunflower) seed oil, lecithin, tocopherol, glycerin, citric acid, citrus grandis (grapefruit) peel oil, citrus lemonum (lemon) peel oil, citrus aurantium dulcis (neroli) flower oil, canarium luzonicum (elemi) gum nonvolatiles, cymbopogon shoenanthus (lemongrass) oil, sodium benzoate, potassium sorbate, arnica montana (arnica) flower extract, camellia sinensis (white tea) leaf extract, chamomilla recutica (chamomile) flower extract, calendula officinalis (calendula) flower extract, equisetum hiemale (horsetail) leaf/stem extract, foeniculum vulgare (fennel) seed extract, lonicera caprifolium (honeysuckle) flower extract, linum usitatissimum (flax) seed oil, borago officinalis (borage) seed oil, sodium hyaluronate (hyaluronic acid), sulfur, limonene, citral, linalool. You can grab the product with free shipping when you sign up, risk-free, for Amazon Prime. Try Amazon Prime HERE. I might give this a try. My hair loves products with aloe vera juice and jojoba oil. Does it help with curl definition at all? This looks so good but my hear hates glycerin. What’s an alternative to this you can recommend?